Finance Minister Pravin Gordhan’s first comeback National Budget tabled on Wednesday afternoon in Parliament was relatively calm and workmanlike one after all the expectations of tax hikes and spending cuts amid tough economic times. He stressed the need to reaffirm government’s commitment to close the gap between spending and revenue, implementing a plan for stronger economic growth and cooperation between government and the business sector. That should keep the rating agencies that want to downgrade SA’s debt position to junk status temporarily at bay. Personal income tax rates were not increased as was expected and as Nhlanhla Nene did last year, although about R18bn more will be collected in 2016/17. This will mostly be through yet another big increase of 30 cents per litre in the fuel levy as well as increases in capital gains tax, property transfer tax and an increase of about 7% in the usual sin taxes (alcohol and tobacco) A new tyre levy and a tax on sugar intake (only next year on sweetened beverages) will also be introduced. The expenditure ceiling was also cut by R25bn over the next three years to bring the budget deficit down to 2.4% of gross domestic product by 2018/19, and to stabilise debt as percentage of GDP around 45% of GDP. The public sector wage bill will be cut, but provision for contingencies like drought relief and additional spending has been made and increases in expenditure on for example on higher education and small business development continue. Gordhan stressed that the government would not burden South Africans with “austerity measures”, and that social grants will also be raised. The budget deficit will fall from 3.2% in 2016/17 to 2.4% in 2018/19 (3.9% in 2015/16). Debt stock as a percentage of GDP is expected to stabilise at 46.2% in 2017/18 (43.7% in 2017/18). Government will lower the expenditure ceiling by R10bn in 2017/18 and R15bn in 2018/19 by reducing public sector compensation budgets. An additional R18.1bn of tax revenue will be raised in 2016/17, with R15bn more in each of the subsequent two years. Government has responded to new spending needs without compromising expenditure limits. An amount of R31.8bn has been reprioritised over the medium-term expenditure framework period to support higher education, the New Development Bank and other priorities. R93.1bn on transfers to universities, while the National Student Financial Aid Scheme receives R41.2bn. R707.4bn on basic education, including R45.9bn for subsidies to schools, R38.3bn for infrastructure, and R14.9bn for learner and teacher support materials. R102bn on water resources and bulk infrastructure. R171.3bn on transfers of the local government equitable share to support the expansion of access of poor households to free basic services. R30.3bn to strengthen and improve the national non-toll road network. R13.5bn to Metrorail and Shosholoza Meyl to subsidise passenger trips and long-distance passengers. .R10.2bn for manufacturing development incentives. R4.5bn for national health insurance pilot districts. An amount of R9.5bn will be raised through increases in excise duties, the general fuel levy and environmental taxes. Limited fiscal drag relief of R5.5bn will be implemented for individuals, focusing on lower- and middle-income earners. Adjustments to capital gains tax and transfer duty will raise R2bn. The effective rate on capital gains tax for individuals will rise from 13.7% to 16.4%, and for companies from 18.6% to 22.4%. Transfer duty on property sales above R10m will be raised from 11% tot 13% from March 1 2016. Government proposes to introduce a sugar tax on 1 April 2017 to help reduce excessive sugar intake. A tyre levy will be implemented, effective October 1 2016. The general fuel levy will be raised by 30c/litre to R2.85/l for petrol and R2.70/l for diesel, effective April 6 2016. The Road Accident Fund levy will stay the same on 154c/l as it will be replaced by the Road Accident Benefit Scheme. Tax credits on medical scheme contributions are increased to maintain the current level of relief in real terms. The plastic bag levy is increased from 6c to 8c per bag. 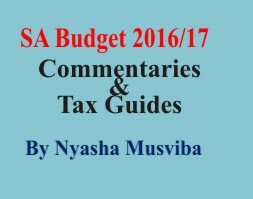 Personal income tax will bring in 37.5% of government revenue, company tax 16.9%, VAT 25.6% and fuel levies 5.5%. Beer 11c/340ml; fortified wine 27c/750ml; ciders and alcoholic fruit beverages 11c/340ml; unfortified wine 18c/750ml; sparkling wine 59c/750ml; spirits 394c/750ml; cigarettes 82c/packet of 20; cigarette tobacco 94c/50g; pipe tobacco 27c/25g; cigars 432c/23g. GDP growth is estimated 1.3% in 2015, 0.9%% in 2016, 1.7% in 2017 and 2.4% in 2018. This is considerably lower than last year’s estimates. Export growth is expected to grow by 9.5% in 2015, 3.0% in 2016 and 4.6% in 2017 while imports will grow an estimated 5.3% in 2015, 3.7% in 2017 and 4.5% in 2017. Consumer inflation will fall to 4.6% in 2015, accelerate to 6.8% in 2016 and is then forecast to consolidate somewhat at 6.3% in 2017 and 5.9% in 2018. Capital formation is forecast to grow by only 1.1% of GDP in 2015, 0.3% in 2016, 1.4% in 2017 and 2.7% in 2018. Household consumption is set to grow by 1.4% in 2015, 0.7% in 2016, 1.6% in 2017 and 2.2% in 2018. The balance of payments will stay in deficit (-4.1% of GDP in 2015, -4.0% in 2016, -3.9% in 2017 and 2018). State old age grant from R1 415 to R1 505 per month. State old age grant for over 75s from R1 435 to R1 525. War veterans grant from R1 435 to R 1 525. Disability grant from R1 415 to R 1 505. Foster care grant from R860 to R890. Care dependency grant from R1 415 to R1 505. Child support grant from R330 to R350.